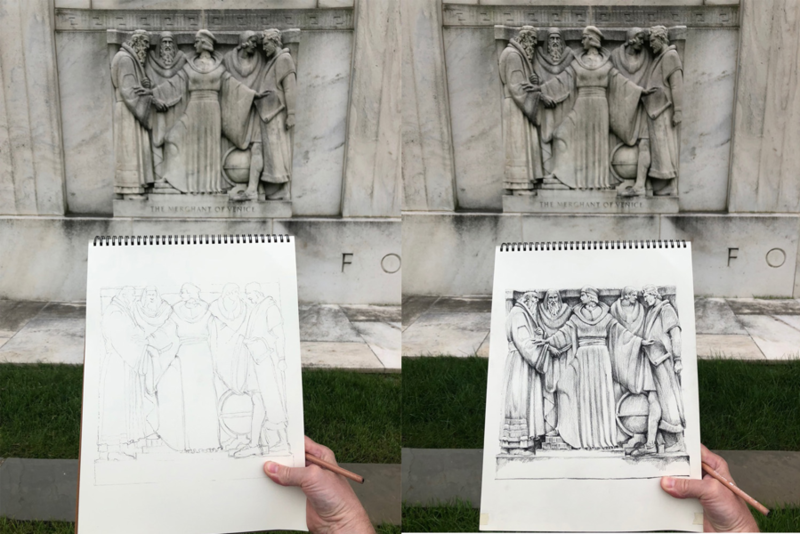 This is the fourth post in a series by artist Paul Glenshaw about drawing the bas-reliefs by sculptor John Gregory on the front of the Folger Shakespeare Library building. The series examines the bas-reliefs one by one; each sculpture depicts a scene from a different Shakespeare play. 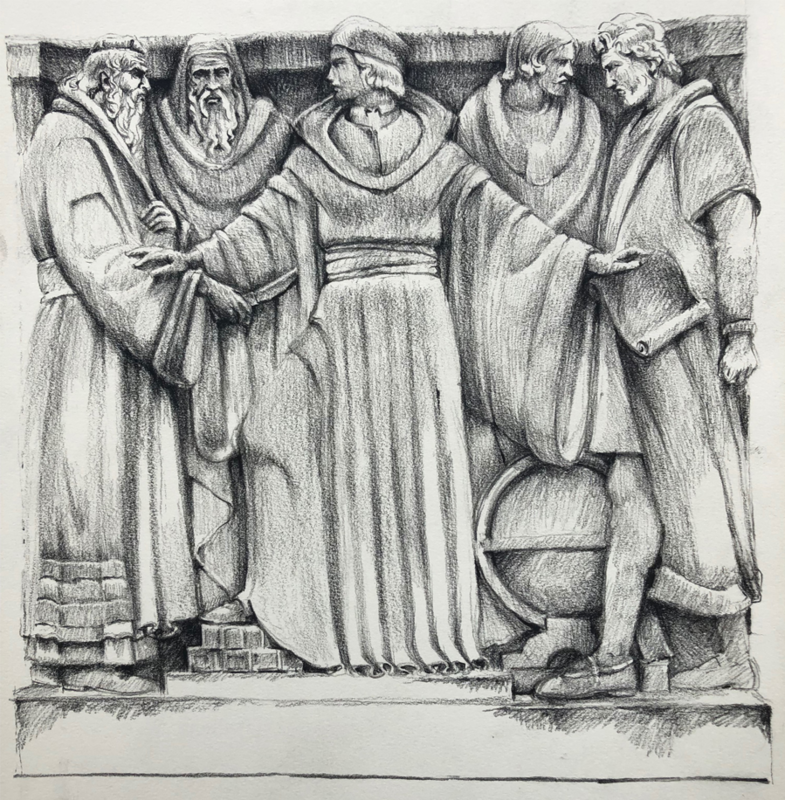 Today’s post is about the bas-relief of a scene from The Merchant of Venice. It is the climactic moment of the play. We’re in the court of Venice. Shylock the moneylender has come to collect on his bond—a pound of flesh from the Venetian merchant Antonio, cut from the “area nearest his heart.” Shylock and Antonio hate one another, yet Antonio has agreed to put up his own body as security for a loan for his dearest friend Bassanio, allowing Bassanio to court and marry Portia, a wealthy heiress. When Antonio cannot repay the loan, Shylock, long the object of anti-Semitic prejudice by Antonio and other Venetians, demands the payment. A young lawyer (who is really Bassanio’s wife Portia in disguise) stands between Shylock and Antonio. First, she declares Shylock’s bond legal. But then she turns to him and says, “Tarry a little.” This is the moment at which sculptor John Gregory puts down his chisel and we are left to imagine the rest of the scene. Within moments, Shylock’s world will be turned inside out. Portia holds him to the exact wording of the bond—“a pound of flesh.” No more, no less. No blood. Anything but the flesh and Shylock will be guilty—as an alien, because he’s Jewish— of attempted murder. Shylock suddenly loses everything and is ordered to convert to Christianity. Portia has saved Antonio, whose only happiness has come through his love for her husband, Bassanio. Through it all, Bassanio has not recognized his wife standing in front of him. In depicting this moment, Gregory plays with symmetry to subtly heighten the drama. Portia dominates as the central figure. Shylock and Antonio are pushed to the two edges of the square. Portia’s arms extend out to each, staying Shylock’s knife in one, holding out the written bond in the other. Gregory makes her a visual pillar of strength, with the folds of her robe coming down vertically right in the center of the square, like the fluting of a classical column. But Gregory breaks the symmetry to make the moment come alive. She raises one knee, resting her foot on some books, and turns her head toward Shylock as she unwinds his plan. Visually, Shylock and Antonio echo and oppose one another. Like mirror images, they face one another, each about the same size and visual weight. They incline their heads toward one another at almost the same angle, expressions focused, intent. But Shylock is headed for Antonio; Antonio braces himself, his legs set one in front of the other. Their fists are clenched—Shylock holds the knife; Antonio angrily grips nothing. The other figures flanking Portia visually separate Shylock and Antonio further. Shylock’s companion looks out passively at us. But Gregory depicts the complex relationship between Portia, Bassanio, and Antonio in one deft move. While Portia turns to Shylock, her husband Bassanio turns his head to Antonio. As the married couple’s heads look away from each other, the longer, deeper relationship between Antonio and Bassanio is revealed—their heads seem about to touch. The challenges in drawing Merchant were many. Gregory compresses the figures from left to right, but they’re also all pushed to the front. There’s very little depth suggested, so the overlaps and contrasts between forms must be very clear for that shallow space to be at all plausible. There were also many little details that help depict the characters—Shylock scowls, Antonio looks grim. Their curly hair, beards, robes, and shoes have intricate twists, long swoops, and subtle swells in both line and shading. The trappings of the court—the books under Portia’s foot, the globe beside her—although simple enough to draw on their own, were surprisingly hard to fit proportionally. I kept having to make each bigger than I thought. As always, it never hurts to draw lightly at first and have a good eraser. At left: The merchant of Venice (act 4, scene 1). John Absolon. Etching by Edward Finden. 19th century. Folger Shakespeare Library. When Gregory planned his bas-relief of The Merchant of Venice, he drew on other images of the same scene. The print above from the Folger collection shows clear precedents for his depiction. Portia’s costume in his sculpture is an art deco-ish twist on the lawyer’s costume that is often seen—extra-long sleeves, prominent collar, and a lawyer’s cap. But the square format of the bas-relief compresses the figures together, as opposed to letting them spread out across a stage. Gregory uses this alteration to his advantage, creating drama in a scene where his actors must communicate, but will never move nor speak. Completing Merchant meant I was a third done with the series: three reliefs down, six to go. Looking to the next sculpture, I instantly recognized the three witches, a cauldron, and the imposing figure of Macbeth. But I also looked with some trepidation at an amazing illusion Gregory managed to pull off, something I’d never seen before: smoke made out of stone. I’d never drawn anything like that. Read the introductory post to this series and see a slideshow of Paul Glenshaw’s drawing process.